In the 19th century, Christian Gobrecht’s popular “Liberty Seated” design was the most prominent image on a coin. It also had the greatest longevity of the United States coinage of the time. The Seated Liberty design was first seen in 1836 on a limited number of silver dollars. It entered widespread use in 1837, when the half-dime and dime were first struck with obverses bearing the Seated Liberty design. The Liberty Seated design was used on several coins — including the quarter and the dollar coin. Christian Gobrecht was a German-American born in Hanover, Pennsylvania in 1785. His early life saw him develop as an artist and engraver. He was also an apprentice for a clockmaker, during which time he honed his skills as a respected engraver. After moving to Philadelphia in 1811, he eventually became well known for his engraving work. By the 1820s, Gobrecht had begun engraving dies and had an interest in working as an engraver for the U.S. Mint. Though he was not offered the position of head engraver for years, he did do some important work for the U.S. Mint producing some punches. In the late summer of 1835, Gobrecht was officially hired as a second engraver after primary engraver at the time, William Kneass, suffered a debilitating stroke. Work soon began on a new design for the silver dollar — which became the first coin to bear the Seated Liberty design that famously adorned most of U.S. coin denominations during the bulk of 1800s. Silver dollars produced from 1836 through 1839 are popularly referred to as Gobrecht dollars. 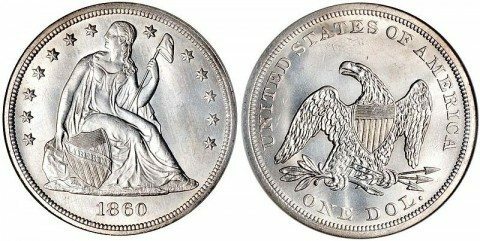 Silver dollars produced from 1840 to 1873 are called Liberty Seated dollars, even though they still bear the Seated Liberty design. By 1840, the Liberty Seated design had been placed on the obverse of all coins — ranging from the half dime through the silver dollar. The Liberty Seated design also appeared on the briefly struck 20-cent piece (1875-1878). Gobrecht passed away in 1844, but his renowned Seated Liberty design would go on to grace our nation’s coins until 1891. Liberty Seated coins have a very strong following of dedicated collectors. Of interest to coin collectors are the several minor varieties that were made to various aspects of the Seated Liberty coins over the several decades that the design remained in use. Values of for Liberty Seated coins vary. “Type” values for each of the Seated Liberty denominations can be found below. All values above are from the Guide Book of United States Coins by R.S. Yeoman and Kenneth Bressett. For more about Seated Liberty coins, check out the Liberty Seated Collectors Club.